From something as simple as daylight savings time to something as challenging as international travel, time changes are tough adjustments for most kids. I often laugh when I struggle to even move my son’s schedule by a one hour time difference. Trying to get kids to sleep when you want is an awesome way to feel totally inept as a human being. It’s not easy, and it’s rarely a simple solution. I’ve experienced my fair share of kid’s schedule adjustments though. We’ve traveled across time zones both domestically and internationally about 10 times since my son was born 2 years ago. We’ve moved our son’s schedule from a few hours all the way to a complete day/night swap during international travels from the U.S. to Japan. Allow for 24 hours of recovery sleeping. This means when you initially arrive at your destination, allow your child to sleep when they are tired for as long as needed during the first 24 hours. 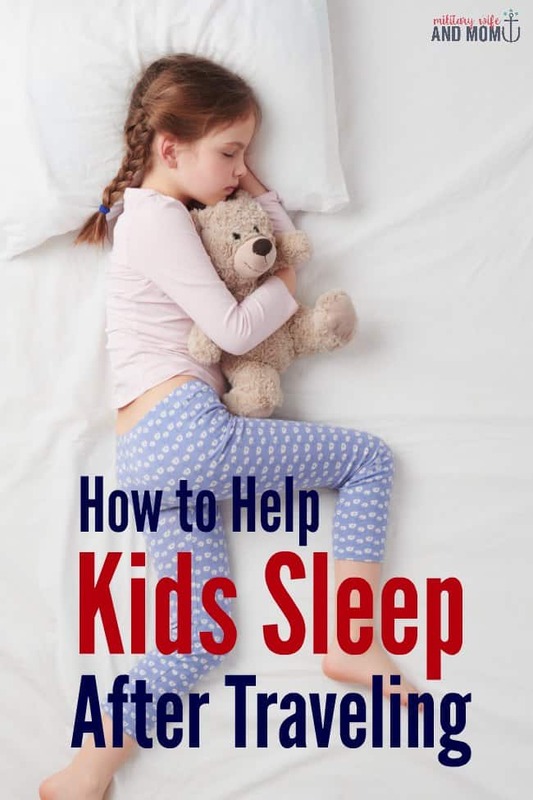 Most children lose out on a considerable amount of sleep during travels and need a bit of recovery before you can even begin to think about shifting sleep schedules around. Create a zone of comfort. Change is hard for kids to understand and can create some anxiety. Help your kids feel secure and confident in the change by showing them where they will sleep. Talk about where they will sleep and that you will be nearby. Bring a few items from home that are very familiar (e.g. blanket, stuffed animal) to help create a zone of comfort. Room sharing isn’t my personal favorite thing to do, but this is something that offers kids a huge sense of comfort and security. If they know you are in the room, especially after traveling, they are more likely to feel secure enough to allow their bodies to rest. Consider a prolonged bedtime routine. Most recently when we traveled from Japan to the US, we started a prolonged bedtime routine to offer our son a little bit more TLC. We often laid down with him in the room to help ease him into sleep. Often times an extra fifteen minutes of snuggling before bedtime was enough to help him feel secure in a new environment. 4 Ways to Help Kids Sleep Stay on Track After Traveling. Limit naps to normal nap length. After the first 24 hours of sleep recovery, go ahead and wake your kids up from naps after a normal amount of time. This means if your child normally sleeps 2 hours for an afternoon nap, go ahead and wake him after 2 hours. It is not easy to wake them, especially when you know they are still adjusting and tired, but this is one of the most effect ways to adjust kids to a new time zone. Wake your kids up in the morning. Whatever your desired wake up time is for your kids, go ahead and wake them. If your kids normally wake up at 7 am or 8 am, wake them up rather than allowing them to sleep late. This holds true even if your kids were up a bit during the night. Truly, this is one of the most effective ways to adjust kids to a new time zone. Continue to work your way closer and closer each day to your desired schedule. For some kids, adjustments may take 2-3 days; for other kids, this can take up to 2 weeks’ time. Often an arduous process of switching kids from time zone to time zone, it is possible to adjust kids in a reasonable amount of time if you really make an effort to switch them over. On our most recent trip from Japan to the US, I used the above method to completely swap my son’s days and nights, and it took about 5 days to get him switched over. Keep things very low key during night waking. There were several nights when my son was awake for a few hours and one night where he was awake for 4.5 hour straight. If you experience this, it is completely normal. Keep the lights dim and avoid as much stimulation as possible during a night waking. If neither you nor your child can sleep, read a book or sing songs quietly or do any quiet activity that suits your fancy. The goal is to avoid treating a night waking as a regular daytime activity, which encourages our bodies to wake up and stay awake. Keep inching your way over to the new time zone and try your best not to allow your kids to sleep the day away. Many will try to do this because their bodies’ melatonin is trying to keep them on the old schedule. So again, the best way to help kids adjust to a new time zone is to really commit to the new schedule and diligently try to switch them over a bit each day. What’s your best tip to help kids sleep after traveling? Let’s chat in the comments. Hi Lauren, I’m not a military wife but am having a few issues with my baby girl. She is going to be 1 in two days. We went away for a holiday about three weeks ago, and though we tried to keep to her routine as much as possible, she was a bit sleep deprived when we got home. Having older kids at home and a busy week meant that it was really hard to keep her on routine, added to that she is hitting milestones, teething, and apparently had some kind of mild virus for a few days last week. She also seems to be struggling with separation anxiety and is quite clingy int he day. The sleep situation has spiralled down and now she cries every time we put her into her cot. In the past she has gone through rough patches (not all at once like this though) and we have cuddled her almost to sleep before putting her into her cot. This worked for a few days and then she’d go back happily to putting her self to sleep. But this time we have been cuddling her for a few days and she now cries whenever we put her down – she wants us to hold her to sleep. When I go in to calm her down, she snuggles in straight away and her eyes start to close on me. I don’t know what to do. I don’t know if my priority should be reestablishing her routine (which to be honest is going to be difficult as the kids are home from school for another four weeks and I’d have to do nothing for a week and make her naps a priority), in which case I’d just keep cuddling her to sleep for a few more days until her body is in a better place. Or whether I should just be firm and keep reassuring her but let her settle herself and hope this helps the routine return. Can I ask what you would do? I’ve tried sitting by her with her in the cot but she just keep standing up and screaming to be held so I think for now I either have to hold her or leave. 🙁 It’s breaking my heart to hear her scream but I can’t cuddle her to sleep indefinitely with two older children to also put to bed, and I also can’t cuddle her to sleep in the day long term. We’ve worked so hard to teach her to fall asleep independently (and happy! ); it’s so frustrating and sad to have it all undone by a couple of weeks. Sorry it took me so long to respond. I can imagine by now things are sorted out? But I will answer for anyone who may read the comments here and have the same issue. I would re-establish routine first. I only encourage kids to self-soothe when they are in a great rhythm/ routine and all their needs are clearly met. Then once they are in an established routine, I do allow my kids to fuss /cry a bit and return to offer comfort. You are 100 percent right, you can’t cuddle her indefinitely. So you have to go with your gut here…with when to allow her to cry and when to give her comfort. Everything she does is a communication to you…so listen to your baby and feel confident that you do not need to “rescue” her from the cot, but rather offer confident leadership that she is in a safe place and that you are there to help her when she needs it. Confident leadership may mean tending to her and saying, “There were lots of changes lately. We are home now. You are safe. I am here. Here is your blankie or a little animal. It is time for sleep.” And then keep working on it. If you’ve sorted through…I’d love to know what worked for you? PS This is a really helpful article and gave me confidence in what I was already thinking – that routine is key!! Sorry I meant to put that in the comment above! !